O Mg! It's the periodic table's B day! Nothing would exist if it weren't for elements and the —relatively — tidy periodic table is celebrating a major milestone, turning 150 this year. Why shouldn't you trust an atom? Because they make up everything (cue groan). Nothing would exist if it weren't for elements and the — relatively — tidy periodic table is celebrating a major milestone, turning 150 this year. 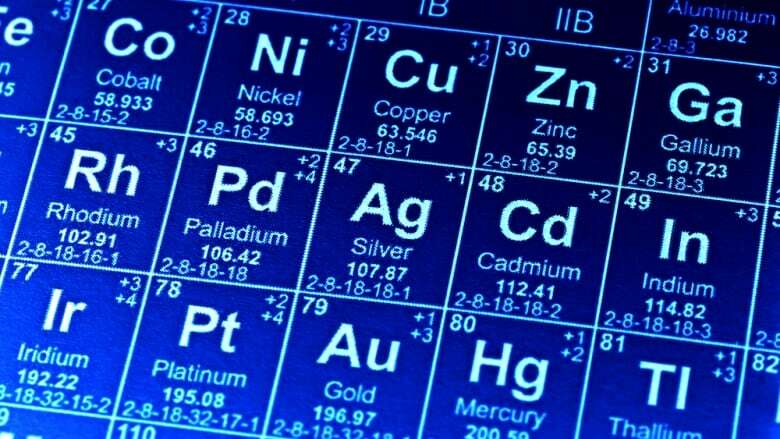 The table's sesquicentennial is such a big deal, the United Nations Educational, Scientific and Cultural Organization (UNESCO) has proclaimed 2019 the International Year of The Periodic Table of Chemical Elements. Carleton University associate chemistry professor Jeff Manthrope was so fascinated by the periodic table, he had one hanging from the wall in his childhood bedroom alongside posters of musicians. "I was just absolutely fascinated by the diversity of elements themselves, the fact there were so many building blocks out there," he told CBC Radio's All In A Day. While the periodic table may seem a staple of science classrooms everywhere, it wasn't so easy to put together. There were several scientists throughout history who formulated hypotheses about elements, but it was Dmitri Mendeleev, a Russian chemist and inventor, who is credited as the father of the periodic table. "Like so many great discoveries, it was almost an accident," said Manthrope. Mendeleev was writing a textbook in 1869 and began to notice patterns, then started assembling known elements by atomic mass. He predicted there were elements that had yet to be discovered and would fit neatly into a specific space, said Manthrope, elements such as Germanium that weren't discovered until 1886. He even predicted their properties. Element 101, Mendelevium, is named after him. Manthrope is leading a Science Café at the Ottawa Public Library's Sunnyside branch on Wednesday at 6:30 p.m. The university will also be holding a chemistry magic show on Saturday. Maybe you like the malleability and shininess of Au, or the old fashioned (and dangerous) Pb pipes, or a living C? What's your favourite element and why? The comment section is open. Don't worry about making bad chemistry jokes, because all the good ones Argon.